In my career, I always think about what I plan on doing or how I want to achieve my passions in Architecture. I never think twice about looking at structures and colors with vibrant textures. The thought wasn’t there until I was driving and realized that if I couldn’t see – I wouldn’t be able to drive. To me, not to drive is scary and unfathomable but what if an architect couldn’t see? Can an architect who cannot see still be able to fulfill his or her passion? My question was answered! His name is Chris Downey, AIA. “Architecture for the Blind” He is an architect who lost his vision due to a brain tumor at the height of his career. Mr. Downey talks about multi sensory design and how the blind must rely on other factors beside vision to think or create. 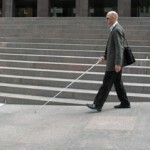 He says, “blind people rely on acoustics to get around. I test materials with my cane to see how they feel. Instead of doing a ‘walk-through,’ we create a ‘tap-through,’ so you hear what it’s like when you tap your cane throughout the building.” Prato, Alison. “Chris Downey: My Life as a Blind Architect in San Francisco.” Ideas .Ted.Com 30 Sept. 2013. Thus, he gives us an idea of how he frames without seeing by using wax sticks with his fingers. Taylor-Hochberg, Amelia. 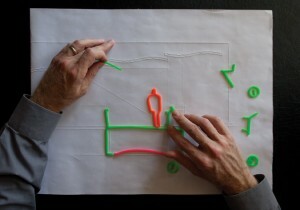 “How a Blind Architect Reframes Design.” Architect News . This entry was posted in Architecture and tagged blind architect architecture. Bookmark the permalink.